You’re given the budget to launch a new website/magazine/journalistic enterprise of your choice. What’s it about and what’s it called? It’s called “Hobby Horse.” It’s people explaining their particular obsessions at enormous length; since I’ve got the budget for it, it’s edited so that every essay is wildly entertaining and comprehensible to a general audience that has little or no relevant background. What’s your favorite incarnation of Star Trek? Deep Space Nine, by a space mile. It was the series that was the least comfortable with Trek as was and the most comfortable making fun of the tropes lovingly, and (in retrospect) feels very much like Ron Moore preparing for Battlestar Galactica. Second favorite is probably the original series. 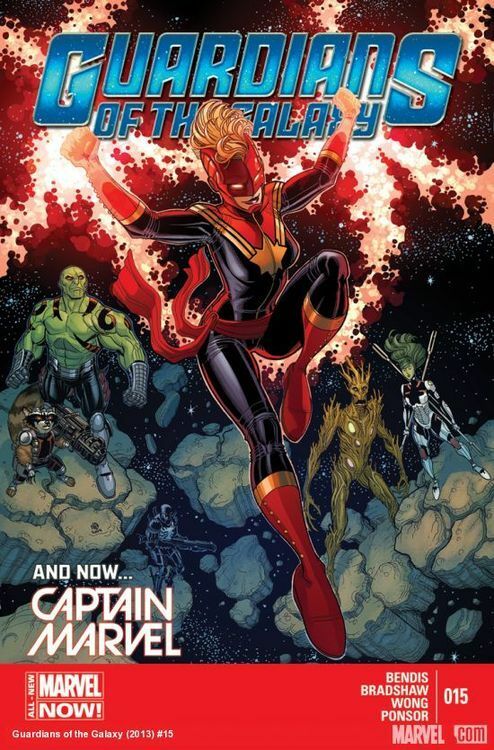 I understand solicits go out months in advance and cover art doesn’t always reflect the story, but it seemed odd that Captain Marvel was nowhere to be seen in issue 15 of GOTG, is it just an instance of story ideas expanding beyond initial plans? what happened was was that I had a pretty fantastic entrance for Capt. Marvel but took it out because I kind of like the hopelessness of the issue. I like that many of you have no idea how the guardians are going to get out of all of this. I promise you she is in next issue and many issues to come and narrates the Guardian’s annual. I love that they didn’t just swap the cover out for something different. Nope. Just committed and followed through. That’s… something. Only one artist is listed in that creative line-up. Is that because they only have one artist signed up, or is art that unimportant to the company? Of course Alan Moore is “revisiting” an existing character. For such an important, revolutionary comic creator, the extent to which Moore revamps existing properties instead of creating new ones is kind of amazing. Miracleman, Swamp Thing, Watchmen, Supreme (which is a one-two punch, considering the 1950s Superman tribute he turned the character into), League of Extraordinary Gentlemen, Lost Girls, and arguably Tom Strong and Promethea, as well… I’m sure I’ve forgotten some in there (Does From Hell count, in that he didn’t create the characters per se? Hmm). It’s oddly fascinating to me. Re #2, I think at this stage it’s just What He Does – Moore is an artist who is fascinated by lots of different aspects of the relationship between creativity and culture, and using existing cultural properties as icons or totems or IDK jokes is a good way to explore that. I’ve noticed people on Twitter jumping on this, but it seems no more odd or negative a tendency – not that you’re saying it’s negative – than Garth Ennis writing yet another war comic, which I see we’re also invited to get excited about. It’s interesting that he does this, of course, and I remember that Amazing Heroes (?) list of What Alan Moore Is Reading from 1988 or so which was basically all original-IP indies – Love And Rockets, Puma Blues, Cerebus, Beanworld… I think Zot! and American Splendor too, EXACTLY the reading list any diligent Comics Journal reader who was sick of superheroes would have put together. (Also, perhaps importantly, almost all ‘writer-artists’ to use the ungainly term of the era). And a bit after that he starts Big Numbers and From Hell, which are very much the Alan Moore projects you might predict someone with those tastes would have. That feels like a real pivot point – I wonder the extent to which the failure of Big Numbers (and the difficulties in getting From Hell done) affected his creative direction. After that, as everyone points out, he tended to prefer working with existing ideas, characters, etc. Oh, I think Big Numbers is crazily important in the grand scheme of Moore’s originality as a comic book creator – I think the failure of that project really impacted his idea of what comic readers “want” as a whole, and also what the medium can and can’t support in terms of subject matter. I think the way in which Big Numbers fell apart cemented his opinion of mainstream comic book culture as something intellectually retarded and unwilling to engage in anything other than nostalgic reworkings no matter how ambitious they may be in scope or executions. It’s odd to wonder what Moore would be like had Big Numbers made it to completion. What comics would be like, in fact. “Fans trump audiences,” Meeker said, crediting the observation to Netflix CEO Reed Hastings, who will speak tomorrow before the show closes. “An audience changes the channel when the show is over. A fan base shares, comments, creates content” when the show is done, magnifying the show’s reach and engagement with existing and potential new audiences. And the research suggests that, “when TV is combined with social interaction, there’s a nice lift for brand/purchase/advertiser recognition,” improving the impact of ads that accompany those shows. Unsure how I feel about this. On the one hand, it’s a point that’s difficult to argue, but I also worry about the idea of creators pushing in directions that are essentially narrowcasting fan-service all the time, which strikes me as a dangerous way to go.